It’s that time of the year to give thanks and be grateful for all our blessings. I am thankful for many things in life, of course my family, friends and for my health, but I am also very thankful to all of you – my readers and my customers. As a small business owner it means a lot to me when you shop with me. I work very hard every day on all aspects of my business and when I get an order from you – it really makes my day! It tells me I am doing something right. So thank you for all your support for Jacket Society. In order to celebrate this special holiday season with you and show my thanks, I am starting our annual Thanksgiving Holiday Sale today. No code necessary, discount is calculated automatically in your cart. The sale will continue through the weekend and end Monday, Nov 26th at Midnight. All USA Shipping is FREE and international shipments are a flat rate of $25.00. I hope you take advantage of these great savings and grab one or two of your favorite pieces or even start your Holiday Gift Shopping. For today’s looks, I have restyled our best-selling Brittany Boucle jacket, this time in a bit more casual and laid-back look. I paired it with my skinny jeans and our Ivory V Neck Long Sleeve Top and added one of our new scarves which is very pretty. 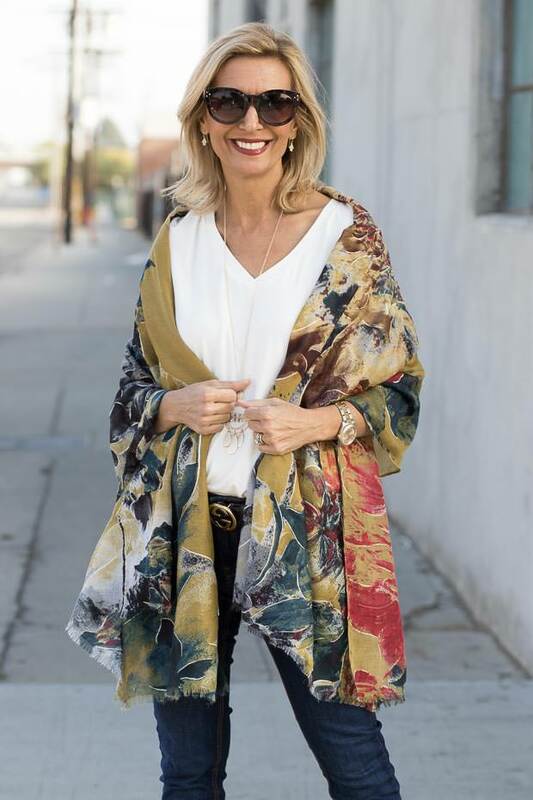 The abstract print of the scarf has beautiful colors like olive, navy and reds with a splash of metallic gold, and as you can see it looks great with the jacket. This scarf also looks great with our Burgundy Cape Vest with Fringe, which is the second outerwear piece I styled with the same outfit. This cape vest is a pretty shade of burgundy and its exactly like our other best-selling cape vests except it has a self-fringe all around it which makes it even cuter. As for jewelry, I added our Matt Gold Chain Necklace with Round Pendant and Beads which is an all-around great matte gold necklace. All of the pieces that I am wearing here today are obviously part of our Thanksgiving Holiday Sale. The links for them are below, but make sure to stop by and check out all our items in our shop. Finally, I want to wish everyone a Happy Thanksgiving. I truly appreciate all your lovely comments and emails that you send me and I look forward to offering you more products and style inspirations in the future. I hope you all have a wonderful holiday with your loved ones wherever you may be. What are your plans for Thanksgiving and how do you like my looks? What stunning looks Nora! I am eyeing that scarf! 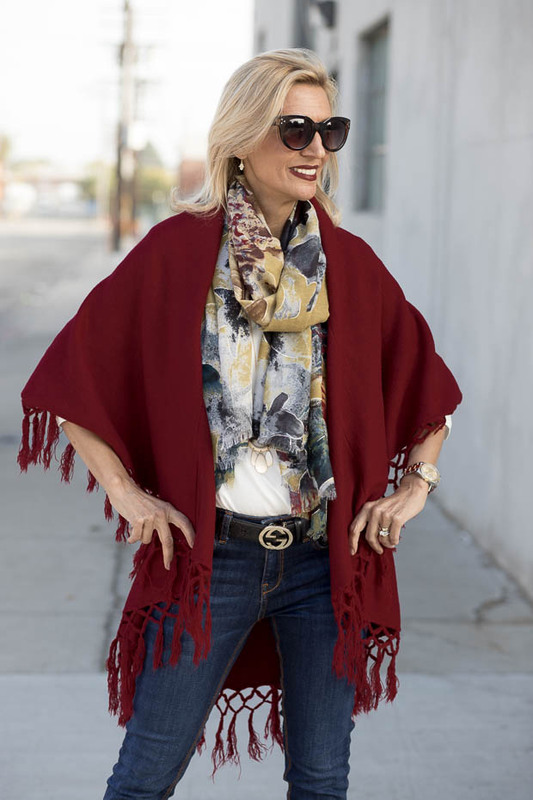 I love the colors and it really pops with the beautiful burgundy poncho. Great structured jacket too! Thank you so much and a Happy Thanksgiving to you too! Thank you so much! I’m glad you found it! Just an FYI if you are interested in purchasing anything, today is the last day of our sale. All items are automatically discounted according to how much you spend. Also you can sign up for my weekly blog stories by registering to our list.